Sony has announced two new additions to its Alpha line of digital SLR cameras: the A290 and the A390. These entry-level DLRS are essentially slightly upgraded versions of two existing Sony cameras, the A230 and A380. Both cameras have subtle design changes—the grip has been improved and a few of the upper control buttons have been shifted around. 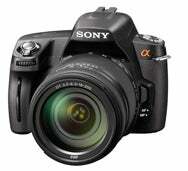 The biggest change is that the $500 A290 has 14 megapixels, which is a four megapixel increase over the A230 model. Most of its other features are the same as the A230, including the 2.7 inch LCD screen. Sony’s new higher-end DSLR model, the $600 A390, is also very similar to its predecessor, the A380. The A390 still has a tilting LCD screen and auto-focus live view features. These refinements may be mild, but the new cameras still boast solid feature sets, intuitive in-camera help guides, and very reasonable price tags. Together, these details have made Sony's entry-level DSLR line extremely popular with photographers taking their first steps out of the point-and-shoot world. It's no surprise that Sony is sticking with what works. The A290 and A390 will begin shipping next month.